» Lighting the path; how about rules? Lighting the path; how about rules? Rules were hardly necessary here when it looked like no one was on this beachside path. On Wednesday Albany’s downtown urban renewal board will consider spending up to $300,000 for new lighting along the Dave Clark Trail. The idea is to make the path safer when the sun goes down so that more people will use it. If more people use it, I hate to say it but some rules will have to be posted too. Lighting the path is plainly a good idea. It should embolden customers of nearby restaurants as well as the general public to use the trail at night. It should discourage shadowy elements who prefer the dark, and if it doesnt discourage them, it should enable the police and the rest of us to see them. No matter how brilliantly the path is lighted, I don’t foresee nighttime traffic jams on the Dave Clark Trail. Daytime use during the summer is something else. The riverside trail is what we now call a multi-use path, meaning that conflicts may ensue. Conflicts? Well, yes, for instance between skateboarders or bicyclists and walkers, especially when the cyclists are inconsiderate or going too fast, or if the walkers are walking five abreast, spanning the entire path with their combined girth, or are listening to the Grateful Dead on their ear buds, or if they are walking dogs with leashes stretching from one side of the path to the other. 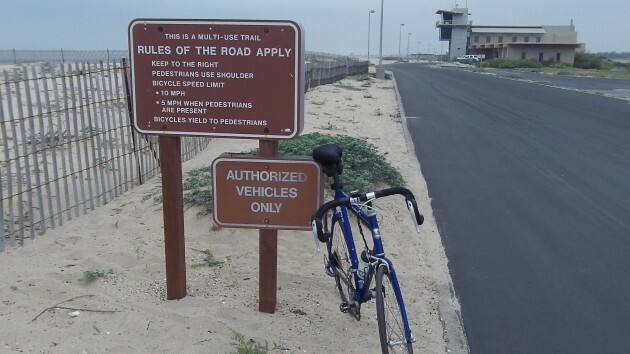 I was thinking of this while cruising the unusually empty multi-use path along the Pacific Ocean in Huntington Beach the other day and spotted the sign shown here. On a blustery weekday in March, this path was deserted, but at other times it is teeming with throngs of locals and tourists, most of whom ignore the instructions on that sign. But at least they’re on notice about what’s required on a multi-use parth so no one gets hurt. In width and other aspects, this Orange County path bears no resemblance to Albany’s Dave Clark Trail. $300,000 for lighting on a path very few people will use. $300,000 here, $300,000 there – all money that could be going towards police and fire stations instead. I guess it might result in “more civilized drunks” using the path after the sun goes down. Maybe they’ll push out the “rude drunks”? Ah yes, pet projects with a majority of the money coming from those who will never use the path. Gotta love well planned spending like that. Glad it will come from Albany taxpayers pockets and not mine. Sadly those ideas like this have a tendency to spread. Next step they’ll want to light the skateboard park in Lebanon. The question of Why could be applied to most expenses which can be seen as luxurious or aesthetic or inefficient. Why spend money on parks which I don’t use? People who want to play ball should foot the bill. Why pay for summer concerts? Let those who attend foot the bill. Why pay for landscaping along city streets? Just get mower and mow down whatever grass comes up. Why offer recreation classes such as yoga, art, guitar, gardening, photography, or teaching the elderly to use an ipad? Just another waste of money. Why support the Arts & Air festival? Why spend precious police resources on the D.A.R.E program — it doesn’t appear to work? Why waste money on the public library, when one can find any information on the internet, or buy an inexpensive book at Browsers? Why light a bike/walking path in a section of the city that I never intend to visit. Don’t forget to add that many people only use library because it has internet. Hasso, welcome back home, I enjoyed seeing your articles on bicycling while you were in California. Thank you for informing me about the DARE program, I didn’t know it had ended, I just remember my girls going through it in middle school. Also, I was aware of the participant fees, but it seems like there must be some overhead that is paid for by the city, even if it is just administrative, to support the ‘Rec’ side of the Parks and Rec department. I’d love to see the return on investment calculation that the CARA Advisory Board will surely review. There is a positive tax increment for this $300,000 “investment”….no? One of the sad parts about this is that the cyclists take most the abuse about these expenditures. Walkers/joggers get a “free ride”. Lighting this path isn’t about either. It’s an attempt to drive out the “neer do wells” that habituate this pedestrian path that allows bicycles. I simply can’t imagine anyone going across town in the dark to use this path because it’s “lit”. A few more street lights on S. Geary between 28th & 34th would make FAR more sense!